While alternative pathways and credentials have gained momentum (and headlines) in recent years, evidence of their return to students is scant and quality assurance is "weak." So concluded a report that examined these options that exist outside of or alongside traditional undergraduate degree programs. Competency-based education programs, which tend to "more personalized, flexible, and aligned with in-demand skills." The researchers found that while alternative credentials "have proliferated over the past 15 years," the idea behind them is hardly new. "While alternatives have grown in recent years, options like trade schools, distance education, work-based training and assessment of prior learning have been around for decades or centuries, and their popularity has ebbed and flowed with contextual forces," the report stated. 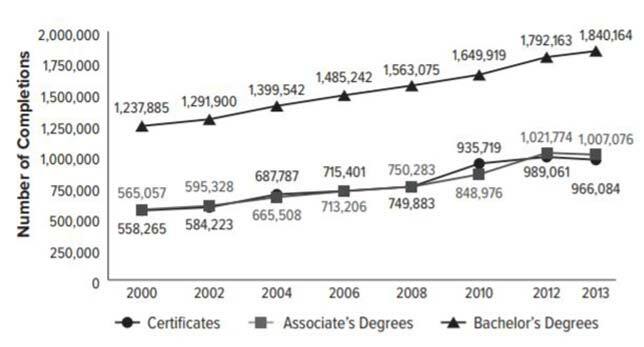 Credentials awarded by Title IV postsecondary institutions between 2000 and 2013. Source: "The Complex University of Alternative Postsecondary Credentials and Pathways," published by the American Academy of Arts & Sciences. Also, while these types of programs show a "great deal of variation," the researchers noted, they do tend to require less time, use more flexible formats and maintain alignment with the skills employers want more closely than traditional degree programs. For their part, the research found, those traditional schools are taking good ideas such as work experience from the alternative programs and incorporating them in their institutions' programs. The most telling finding of the report, however, is the researchers' declaration that while alternative pathways and credentials may have appeal for all kinds of reasons, "evidence of their efficacy is thin and quality assurance is weak." Data is lacking on "features, costs, enrollment and outcomes," the authors wrote, and few have been "rigorously assessed"; where they have, the evidence "is not promising." Certificates awarded by institutions between 2000 and 2013. Source: "The Complex University of Alternative Postsecondary Credentials and Pathways," published by the American Academy of Arts & Sciences. The report urges the higher ed community, funders and policy people to undertake research to examine the return on investment of the existing programs. Doing so, however, will require those same entities to invest in a "more comprehensive data system" to capture longitudinal information on students' experiences and details about the providers. Likewise, thorough examinations of programs will also require development of quality assurance processes to ensure "accurate and comparable evaluation" across providers. The report is openly available in digital form on the academy's website here.